Jed currently serves as the facilitator for the Presbyterian Hunger Program’s Joining Hands program. Jenny currently serves as the site coordinator for the Young Adult Volunteer program. Joining Hands is an initiative of the Presbyterian Hunger Program that addresses the root causes of hunger through networks of churches and non-governmental organizations in developing countries. These networks lead the struggle against hunger and poverty at the local level and are joined by Presbyterian Church (U.S.A.) presbyteries and congregational partners that address the same concerns on the global level. Jed grew up in Virginia Beach (he attended KGPC) and Arkansas. He graduated from St. Andrews in North Carolina and McCormick Theological Seminary in Chicago. After college, Jed worked in the Philippines as a Young Adult Volunteer, as an associate pastor in New York, and as a volunteer coordinator in Nicaragua. Jed was ordained as a teaching elder in 2000. Jenny grew up in Peru, surrounded by hardship and violence. Her father told her to never stop praying. “I learned from him that God is our refuge, and I felt safe.” She crossed paths with Presbyterian mission co-workers in Lima and discovered Joining Hands. 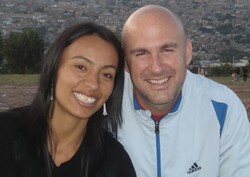 She earned a business administration degree from Alas Peruanas University in Lima. Jed and Jenny met in 2009 and married in 2010.